When discussing an issue or solving a problem, people often jump to conclusions before they spend time talking about what the problem is – or what data they have at hand. 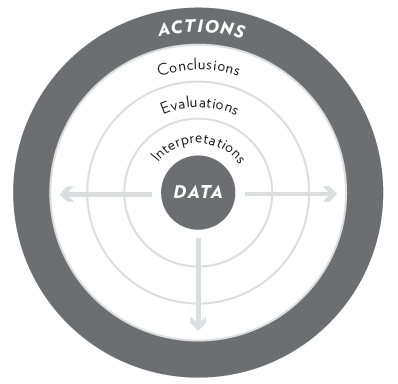 The Circle of Assumptions teaches us an orderly way to think about problems, starting with data and building toward conclusions. It enables us to see how easily our communication can be garbled by our failure to be aware of our own assumptions – and how they affect the conclusions we reach. To communicate productively, a group has to be able to challenge its members’ assumptions. The most important assumptions to examine are always the ones that people cling to most dearly. Often these assumptions are based on deeply held beliefs. Challenging these beliefs and assumptions in a productive way helps us learn and understand what motivates us – and can dramatically increase the quality of the group discussion and decision-making.